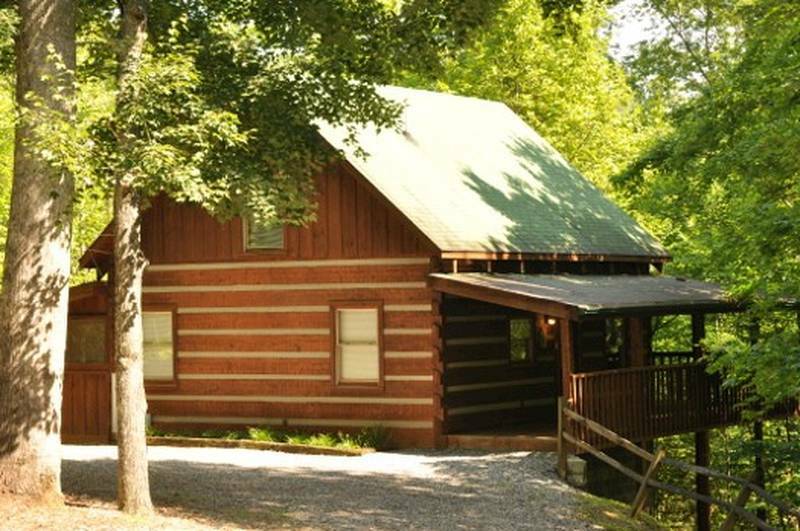 Cozy Mountain Hideaway is your perfect getaway for a honeymoon, anniversary or weekend getaway. Tucked away in the wooded area the hot tub invites you to sit and relax after a day of hiking or enjoying town. Enjoy a romantic evening in the inside Jacuzzi or challenge your love to a friendly game of pool. Cozy Mountain also has Wireless Internet service for your convenience and FREE local and long distance calling. The cabin was nice and cozy. I do think it’s time to upgrade the TVs and the mattress was super hard!! Overall I’ve always been pleased with my stay with heartland rentals. 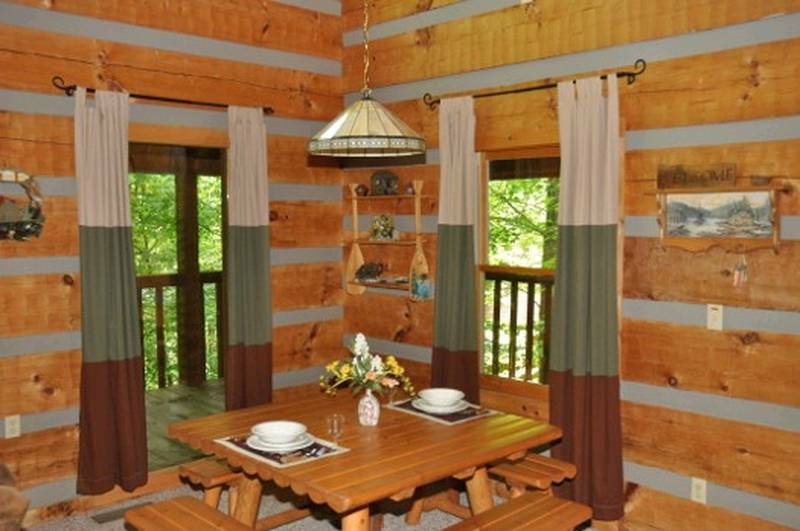 Cabin just as described, easy to get to and great discounts for things to do in Gatlinburg. The cabin far exceeded our expectations. It is every bit cozy and just private enough. I could tell that a lot of care and pride went into this cabin, all the way to the smallest details. The cabin had everything we needed, and the jacuzzi was my best friend during our stay, especially after some of the long busy days we had walking around downtown Gatlinburg. I loved sitting out on the swing in the mornings to get a little reading in and listening to the rooster. We were even visited by a momma bear and three of her cubs in the front yard! We got to watch safely from the inside, while the cubs were climbing the big tree out front, and the momma bear sat near the tree waiting patiently for her babies. When the cubs got through having fun, they just trailed behind the momma bear on down the road into the woods. It was an awesome sight to witness! We definitely wasn’t expecting that! In conclusion, we had a wonderful relaxing stay at Cozy Mountain Hideaway cabin. Thank you! Very clean, was everything it said it would be!! Great time. Everything was as shown in the online pictures. The cabin was very well maintained. Would recommend to friends. Loved the view of the trees. We felt we were sleeping in a tree house. Decorations were nice. Glad to have reclining love seat. The cabin is very nice, but there are some things that could use attention. There is no light for the outside parking and no light over the stairway. An ice maker would be nice. No closet to hang clothes. Perhaps a small beh/table could be put in the upstairs bath for more room. No where to place towels, clothes, etc. Our stay in the cabin was very enjoyable and trouble-free. The cabin was perfect for our anniversary. It is a great cabin in a very good location. 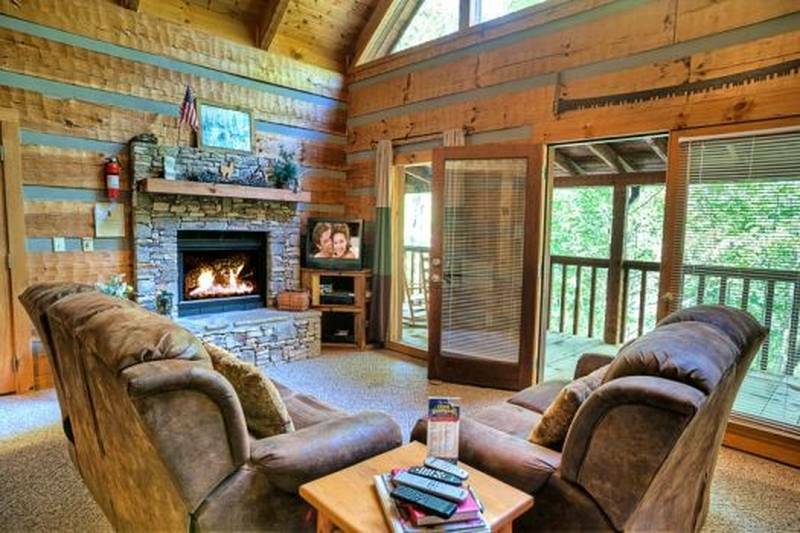 It is private and somewhat secluded but still only a 10 minute drive to downtown Gatlinburg. The cabin was very clean and well prepared for our arrival. Everything about Heartland Rentals was excellent. They really do take care of you from booking to departure. A good company. we went up for our Anv. and this year was 45yrs. Love the Cabin the setting and the way it is kept clean. The only thing is wish we could use the fireplace for a nite, already turned off for the season, but it did not spoil our trip. Hope we will get to come back again, its like our Special place. And thank you for letting us use your home. Wasn't sure what to expect. Was pleasantly surprised. We will be back. Please send more bears to walk by the cabin when we are there. We enjoyed our stay, it's located in between the two cities which was perfect for us! Loved the cabin. Could not ask for anything more. Really liked the location. Cozy Mountain Hideaway was just that very cozy and relaxing. The cabin was very nice. It was very clean. The layout makes the morning sunrise absolutely beautiful. Would like to come back during the warm months to experience the porch and hot tub. We had a great time playing pool. Thanks for a great stay. The cabin was great and we really enjoyed our time. We continue to recommend Heartland to our friends. Everything was wonderful about our stay. Just like the name of the cabin it was very cozy. We stayed a whole week and it wasn't long enough. The cabin was warm and inviting and private enough to feel like we were alone on the mountain. GPS took us straight to the cabin so getting there was not an issue in the slightest. It was a beautiful weekend away in the cabin. The Cabin is just like the picture presented it to be. Very peaceful place to spend a relaxing weekend and only a 10-15 drive to downtown Gatlinburg or the entrance to the National Park which is were we spent most of our time. The only draw back was first trying to find the cabin at night, like many other people have said i would suggest finding it during the daytime to make it easier. Would definitely come back and stay with them again. The cabin was a wonderful place for my husband and I to spend our weekend in Gatlinburg. The screened-in patio was very appreciated , as it allowed us use of the hot tub even on the rainy days. The pool table was a nice addition and the view from the loft offered beautiful fall colors to wake up to. We can't wait to come back! First time visitors to the GSM and the wonderful cabin rental was a huge part of making it such an enjoyable experience. The cabin was so nice, clean and relaxing. We enjoyed our stay very much and plan on coming back soon!! It was the perfect place to stay for our honeymoon! It was the second time that we had stay there. Very clean cabin! Having been overcome by how peaceful we felt at CMH, we suspended our outdoor adventures until Thursday afternoon. While at CMH, we thoroughly enjoyed the two person outdoor hot tub, which was located inside a screened-in porch on one of the two neighborless sides of the home. We also enjoyed the indoor double-wide/two person jacuzzi tub. What a great place to relax, read, spend generous amounts of quality time with the woman I love, and do "other things" together. Oh wait, the wrap-around-porch is outfitted with a porch swing and two rocking chairs facing the woods—Brilliant! For how secluded CMH made us feel, I was thoroughly surprised to be greeted by reliable Internet, not to mention the added bonus of 15/5 Mbps download/upload speeds. We never once turned on either television; seriously, it never once crossed our minds. The peaceful nature of all that surrounded us was sufficient to hold our attention for our entire stay. When we finally left CMH we used the Gateway to Fun pass to go whitewater rafting with USA raft and zip lining on 4.5 miles of cables with Legacy Mountain. Both were a blast! We highly recommend paying extra to ride down the Pigeon River rapids in the smaller raft, which is termed, "The Extreme Ride." Don't let the name fool you; what this really meant was that we were able to work more closely with our guide to have a more personalized experience. All the people in the larger rafts spent a lot of time watching us have more fun, ha! My wife in her own words was, "nervous" about her first whitewater rafting trip, but "had a blast" and "was really glad we chose "The Extreme" ride." The bed: We both found the bed to be comfortable. I suffer from chronic neck and back pain and didn't have any issues sleeping. It would have been nice to have a cutting board available. 1) While very comfortable to lie down on, the couches uncomfortably pushed our heads forward when we sat on them. We were unable to sit on them for an extended period of time. I and my wife are 6'5" and 5'8", respectively, so feel free to take that into consideration. 2) At night, the dining room, living room, and the area surrounding the pool table were dimly lit. We believe the interior wood walls played a big part in this; the lack of lighting could easily be remedied by using brighter bulbs (LED perhaps) in the fixtures. Our visit went above and beyond expectations. The cabin was so comfortable. Very quiet and peaceful for our 30 year anniversary and for a break from my chemotherapy. The cabin was super clean and was the most relaxing place we have ever been to. The staff was very nice and welcoming.. The cabin was spotless, We look forward to returning and trying out all your other cabins. We could not have had a better anniversary. Thanks to all of the staff. Misty was awesome at check in. She worked with us to let us stay another night. It was a great time and we will return in the future. I enjoyed the cabin. Perfect size for a couple and very open interior. The indoor Jacuzzi tub and pool table were nice. The location was good. I didn't have a problem driving up the fairly steep hills to get there, but I'd be nervous if the weather were rougher. This cabin made for a great weekend and I plan to use this cabin again at some point in the future. A lot of time and searching went into finding the best cabin for a romantic vacation, and Cozy Mountain Hideaway was just that. The cabin, location, and staff were great! Everything about this cabin was just as described and advertised. Thank you for a great vacation!! Excellent location, great privacy at the end of a small mountain road. 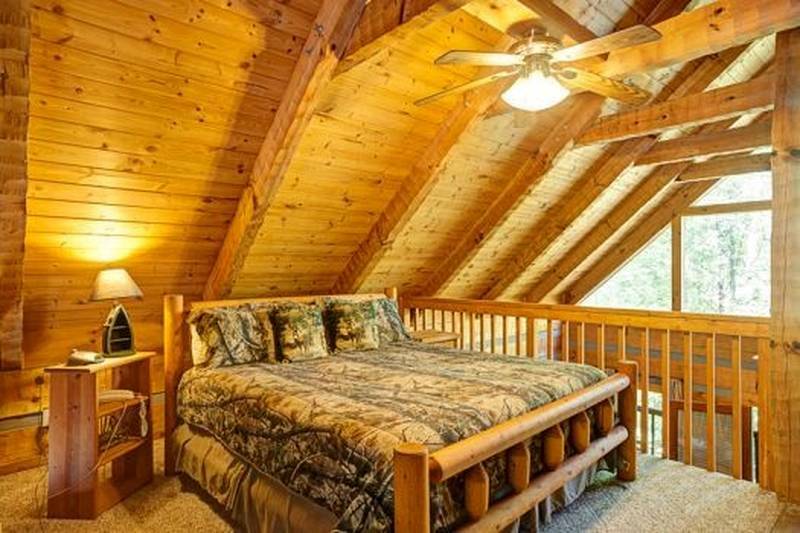 loved waking up in the loft bedroom looking out expansive windows into the forest and mountain views in the distant. Great open floor plan, close enough to the park and trails but far enough for quiet and seclusion. Cabin was in great condition, comfy bedding and couches, check in/out process was a breeze, very helpful staff. Would re book here in a heartbeat! My wife and I really enjoyed the weekend at the cabin. Great location. Enjoyed our time at the cabin. Everything was clean and well kept. Had fun playing pool. Perfect choice for our honeymoon! We loved the cabin and was sad to leave! Perfect size for us and romantic and peaceful. Hot tub, fireplace,jacuzzi, pool table were great additions. Overall great choice for our honeymoon!!! Absolutely everything we were hoping for and more!!!!!!! This cabin was absolutely amazing!!! Everything looked just like the photos that we saw online before getting there. The staff was super friendly and helpful. The "Gateway To Fun Pass" was an added bonus that I found out about after we booked our cabin online and we took full advantage of it. What an amazing weekend!! We will definitely be returning!!! Everyone at the local Gatlinburg office was very friendly, and the restaurant they recommended for our 50th Anniversary was terrific! Perfect getaway and perfect booking agency. We loved the cabin, very clean, up to date and well cared for. We have stayed all over these mountain over the last 25 years. This was one of the best places we have rented. This was our first time using Heartland Rentals and they far exceeded all other companies I have dealt with. We loved our week at Cozy Mt Hideaway. Much needed rest. We loved the cabin and the location. We will definitely be back! Off the beaten path was the perfect location for us but close enough to anything we may want to do if we felt like it. A definite must stay!! We really enjoyed our stay at Cozy Mountain Hideaway. The cabin was perfect. Very quiet and comfortable. We had a wonderful time and we WILL be returning customers for sure!!! thanks so much Heartland Cabin rentals!!!! We enjoyed our stay! Everything about the cabin was great! It was a wonderful week away. We were surprised with unexpected snow and ice and cold. We were cabin bound from Monday afternoon until Sunday morning. The sleet started on Monday afternoon. Heartland called everyday to check on us and even sent a pizza to us on Friday afternoon, because we could not get down the mountain. It is a great cabin, and we enjoyed the peace and quiet. We want to go again - in warmer weather so that we can enjoy all the area has to offer. Thank you for everything. Unfortunately we had to cut our trip shorter than we planned due to family emergencies, but the cabin was great. We enjoyed the coziness, the tranquility, and most of all the jacuzzi! Very relaxing during a much needed time in our lives. The staff were helpful and kind. Will definitely return. A fun and relaxing stay outside of the city! The cabin was beautiful and secluded which is what we were hoping for. We were able to drive into the city and see the attractions then go back to our secluded cabin in the beautiful mountains. We especially enjoyed the big jacuzzi tub and the hot tub. Love this cabin was great for are romantic getaway.